I have been knitting and crocheting baby shoes on and off for quite some time. A while ago I decided to crochet tiny baby espadrilles. 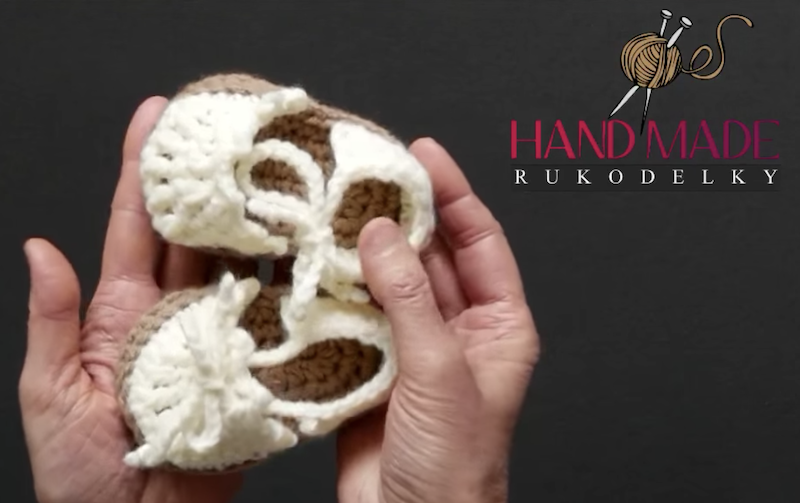 As I was crocheting I made videos for right-handed and left-handed crocheters. I wrote a pattern for these tiny "cuties" you see in the image and a pattern below - but I forgot to finish it and publish it. It is interesting how life gets in the way of my projects. Luckily, this pattern will see the light of the day because one of the crocheter artists asked me about the pattern for these smallest sizes espadrilles. As I was researching my published blogs, this unpublished write up came up. So here you go - below is the free written pattern, and in THIS PLAYLIST YOU WILL FIND VIDEOS FOR RIGHTIES, WHICH GOES WITH THIS PATTERN (and more). Please be aware - since I wrote this pattern a long time ago, I am not sure how accurate it is - so if anyone finds ANY errata - PLEASE LET ME KNOW. Help me correct it, and help your fellow crocheters so they can crochet without frustrations 🌹Thank you and happy crocheting. LEFTIES WILL FIND THEIR PLAYLIST HERE! Length of the espadrilles is 4"
Place 2 soles with wrong side on top of each other and slip stitch them together with light brown yarn (insert your hook between two stitch of both soles at the same time and pull yarn through, then insert the hook between two stitches of both soles and pull yarn through soles and the stitch - repeat all around the perimeter. Do the same with the other pair. Weave in all the ends. With the right side up, and the tip part toward you find the center of the front. Count 10 stitches to the left from the center and place the marker. Then count 10 stitches to the right (from the center) and place the marker. You should have total 20 stitches. Row 1 (RS) Starting at the stitch where you placed your right marker (heel pointed to the right, tip of the sole to the left) crochet 1 sc in each stitch 20x. Turn. Row 7 (RS) *[crochet 3 chain picot, make 3 sl st along the edge]* - 5x, finish with 3 chain picot, sl stitch into the sole. With the right side up, and heel part facing away from you find the center of the heel. Count 8 stitches to the left from the center and place the marker. Then count 9 stitches to the right (from the center) and place the marker. You should have total 17 stitches. Row 1 (RS) Starting at the stitch where you placed your left marker (heel pointed to the left, tip of the sole to the right) crochet 1 sc in each of the 17 sts. Turn. After you are finished with the row continue to crochet ch45 (= 45 chain sts). This will be your string tie. Cut your yarn off. make another string yarn (ch45) to the other side of the corner.